A twist on a holiday favorite – the chocolate orange. 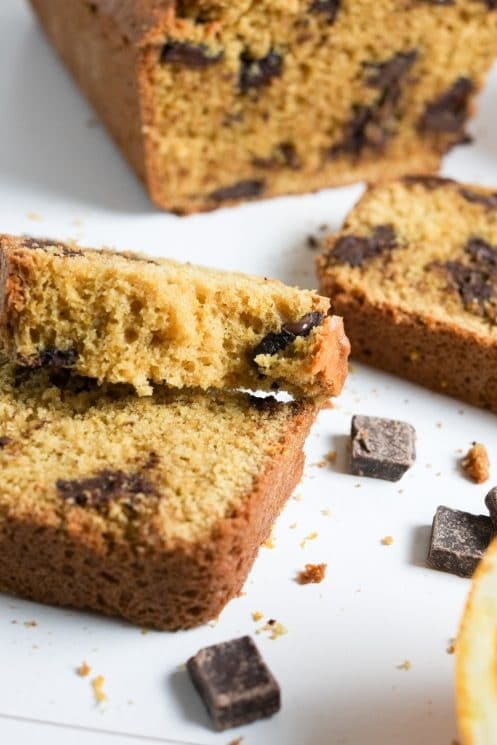 Sweet bread made with real orange juice and zest, combined with white whole wheat flour, honey and dark chocolate chips. 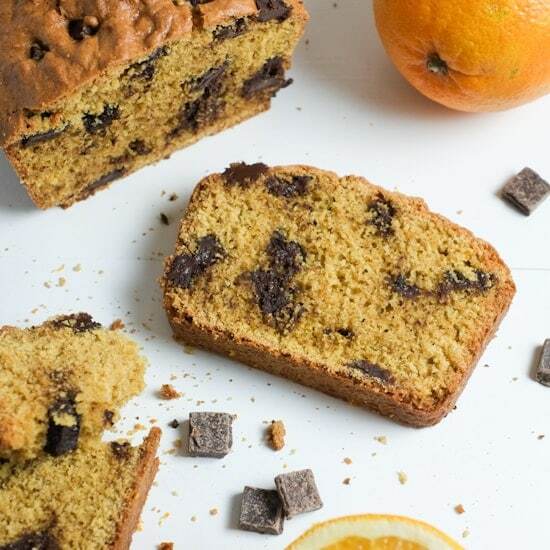 This chocolate orange bread is sure to be a holiday hit! Have you ever had one of those chocolate oranges? I remember thinking those round chocolate balls were such a treat as a kid. I loved pulling one chocolate-y segment out at a time and enjoying it. Truth be told, I haven’t had one in years, but I have a nostalgic view of chocolate-orange combinations because of them. 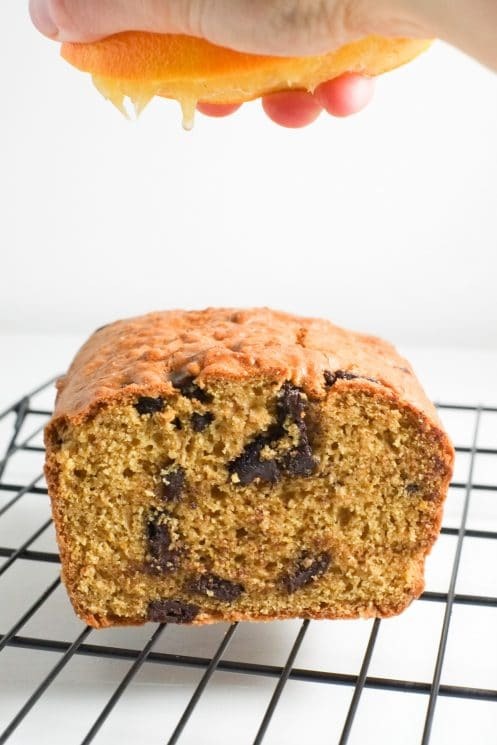 So, why not try and make a sweet bread with these fantastically festive flavors? And thus, the chocolate orange bread recipe was created! And I am so glad it exists because it is delicious! Admittedly, I am a huge sweet bread fan, especially when it includes chocolate, so this was sure to be a hit for me. 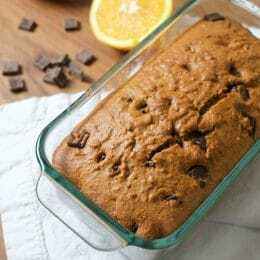 What’s in this healthier sweet bread? I love this recipe because it uses fresh orange! No extract, no store-bought juice, just real orange! Not only are oranges fresh and delicious, they are great for you. Oranges contain lots of vitamin C and are a great source of fiber, potassium and folate. And of course there’s the chocolate! We use dark chocolate because it really does have some health benefits (plus it compliments the orange!). Dark chocolate has antioxidants that have been shown to improve heart health, and the less processed the better. Isn’t it great to feel good about eating chocolate? Just make sure it’s dark! Other healthier ingredients we chose to use include white whole wheat, honey, eggs, and vegetable oil. I love making homemade sweet bread because I can control the amount of sugar (I almost always add less than a recipe calls for), and I know there aren’t a bunch of extra preservatives. As usual, begin by prepping your oven by turning it to 350* F and greasing your loaf pan. Next, let’s work with oranges! You’ll need to zest your orange(s) first so that they don’t collapse as you do it. I made sure to just get the very outer edge of the orange peel because getting too much of the white part makes it more bitter. So quickly zest a spot and move on rapidly. 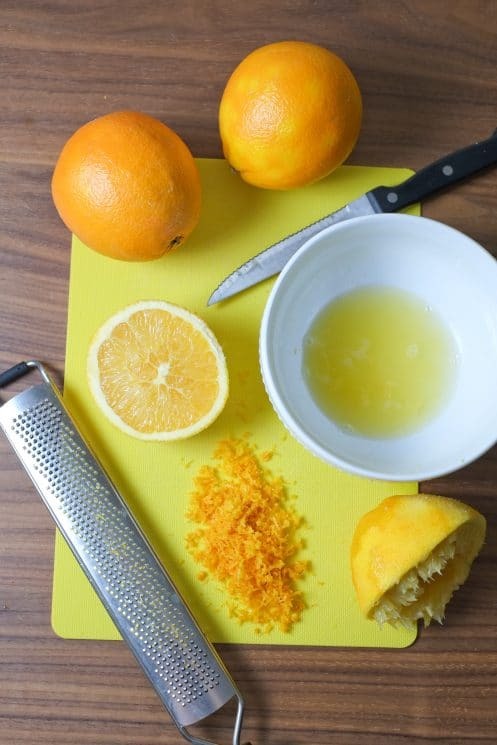 Once you’ve zested 1 tablespoon of zest (make sure to really pack it into the tablespoon), juice your oranges. I just cut mine in half and squeezed them over a bowl, but I know there are some fancier ways to juice. Juice however you want, just get about 1/2 cup of juice. I used 1 1/2 oranges to get the juice and zest I needed, but if you have a large enough orange you may just need one. Once the orange ingredients are prepped, simply combine your dry ingredients in a medium bowl and your wet ingredients in a large bowl. Add the dry to the wet and mix everything up until it’s evenly mixed and then fold in your dark chocolate chips. I used “chunks” but it doesn’t really matter the shape of the chocolate. Pour the batter into your loaf pan, stick it in the oven, and set your timer for 40 minutes. Check by sticking a toothpick in, and bake for 5 more minutes if it doesn’t come out of the center clean of batter. Once the loaf is out of the oven, allow it to cool a bit. Time to Enjoy some holiday sweet bread! Enjoy this bread warm or room temperature – I like it both ways. Store in an airtight container for up to two days on the counter. If you’re eating it within an hour or so, you can squeeze some fresh orange juice on top for a little extra orange flavor. I really enjoyed it this way, just be careful not to do too much and to eat it quickly so it doesn’t get soggy. 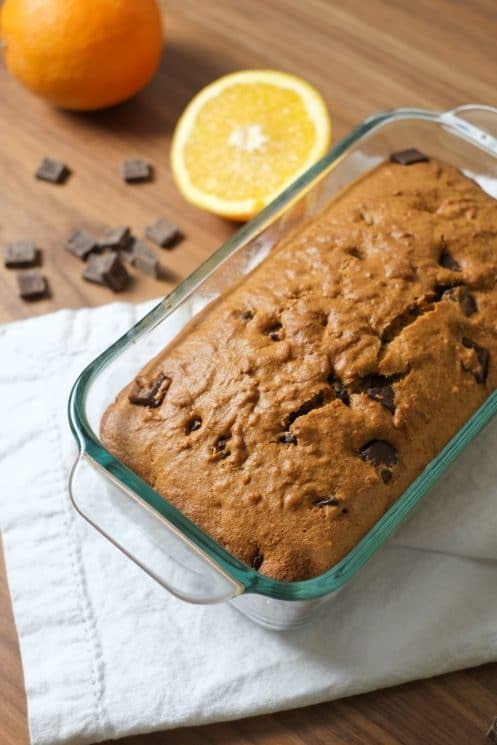 I can’t wait for you to try this chocolate orange bread! Let us know about your favorite sweet breads. Preheat oven to 350* F and grease a 1.5 quart loaf pan. Mix dry ingredients together in a medium bowl: flour, baking powder, baking soda, and salt. 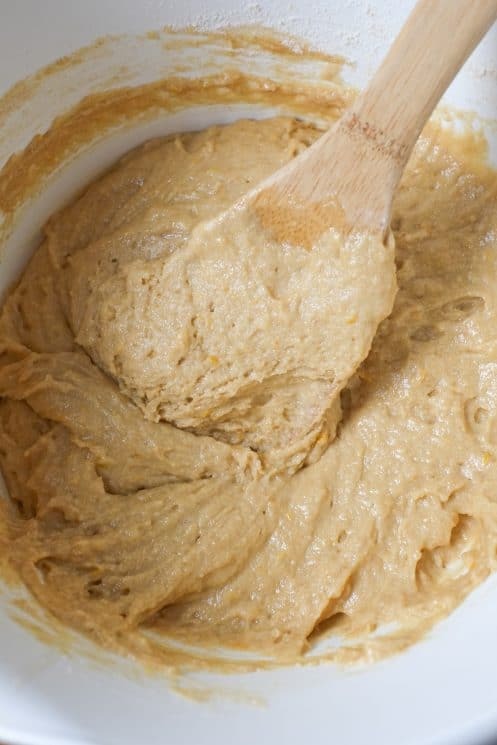 In a large bowl, whisk wet ingredients together until well blended: honey, oil, eggs, orange juice, zest, and vanilla. Combine dry ingredients into wet ingredient bowl until well mixed, then fold in chocolate chips. Pour batter into greased loaf pan and bake 40-45 minutes, until a toothpick poked into the middle comes out clean. This turned out so nicely! It really does taste like those chocolate orange candies. I ended up using tangerine juice and zest instead because they were available and fresh, and it turned out amazing. It was good with a tangerine drizzle. Can’t wait to try orange next time. Thanks for the recipe! These were a hit in my house! I split the recipe into 12 muffins, and baked for about 18 minutes. The orange flavor was too tart and bitter, not balanced well by other flavors. The recipe name is also misleading. It sounds like the bread is chocolate. 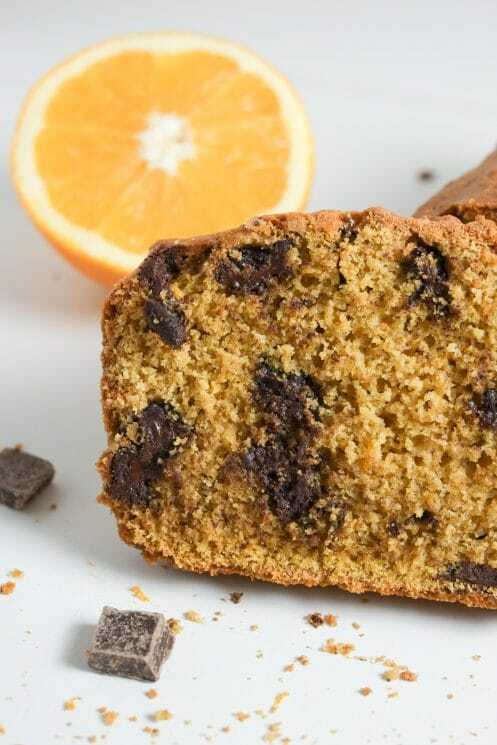 A more accurate name would be Orange Chocolate Chip Bread. I was excited to make this, but disappointed at the results. My kids usually inhale any baked goods….but this one wasn’t a hit. Even with extra chocolate chips the bread was bland and very dry. The whole wheat flour really was too much and gave the bread a very grainy and course texture….almost to the point where it was hard to swallow. : / Sad to waste ingredients, but I couldn’t get anyone in the house to eat this bread! We like the taste, but it’s a bit dry. We will need some milk and/or melted butter added to each slice, but both my 2 year old and I liked it! Does 33/100 olive oil mean 1/3 cup? Hi Ashley, sorry about that! Yes, we’re having a technical issue with our recipe plugin today. We’re working on fixing it now. Thanks for your patience!